Because I have too much time on my hands (see what I did there?). I used to post more photos of my nails, but I started to get a little lazy and didn't feel like getting all creative in the nail art department. 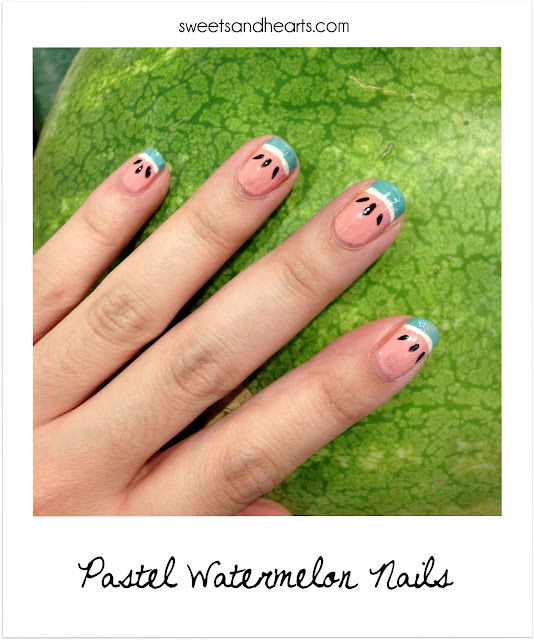 then yesterday, I was super inspired after seeing Erica's watermelon pedicure on fashion meets food and thought I'd attempt to re-create the look on my own fingernails and toes! Apply clear nail polish/base coat and let dry. Paint your nails with 2 coats of pink (or red!) nail polish. Let dry. Use green nail polish to paint a green stripe french-tip style across you nails. With the black detailing nail polish (i've seen these at forever 21 for cheap! ), carefully dot on "seeds". It helps to practice this part on a piece of paper first, so you can determine how the seeds will look.